Do you like saving money (who doesn’t right)? Do you enjoy great tasting wine (ditto)? Are you environmentally conscious (or at least trying)? Then you already love wine on tap. This new trend is really starting to catch on in a big way. However, wine on tap has been available at watering holes across Europe for quite some time now. The West Coast was the first area to jump on the wine keg bandwagon and since then it has sparked intense debate amongst producers, suppliers and consumers alike. The dispute is similar to the apprehension felt towards screw top wine bottles. Many wine experts have a strong preference for the cork. They argue that corks oxidize the wine for better flavor and well, that’s just how it has always been done. We’re all for traditions, but there are many instances of wine going bad because of the cork. Not only does it shorten the wine’s shelf life once it’s opened but some wine can spoil before it’s ever even opened and enjoyed! This leaves two options - either distributors lose money throwing out wine that has gone bad or their customers get to drink unpleasant tasting wine. Neither option is desirable. So why wouldn’t you go with an option that ensures great tasting wine, every time? This is the resounding argument from those in favor of wine on tap. Wine kegs are pressurized with a flavorless gas such as nitrogen to prevent any oxygen from seeping in. This completely eliminates any opportunity outside air or other adversely effecting elements to spoil the wine. Sure you should still let the wine breathe a little once you get your glass but that’s not any different than opening a bottle of wine at first. In the words of Elizabeth Mendez, wine director at Vera Restaurant in Chicago “I think the craft beer industry has helped us prove that you can get wonderful quality from a beverage on tap.” Divinity Systems can definitely vouch for that! 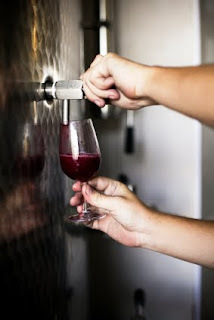 And tasty wine is just the beginning of the benefits associated with a wine tap system. One of the best aspects of wine on tap by far is saving money. 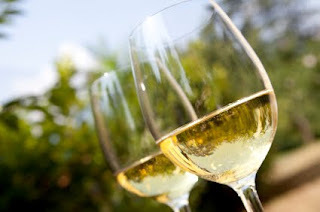 With the recent economic downturn many people are demanding a high quality wine at an affordable price more than ever. Wine tap systems allow consumers, wine makers and venue owners to all save money. Every time you buy a bottle of wine, you are paying for more than just the wine itself. You’re paying for the bottle, cork, foil, cardboard crates, the wine label and distribution. These costs really start to add up for wineries and distributors resulting in an inflated cost for the consumers. When you order wine from a keg you are essentially only paying for the wine and shipping and everyone wins! Since wine kegs are reusable this not only has financial benefits but it’s better for the environment too. Instead of tons of glass, foil, cork & cardboard being discarded in local landfills, the only pollution comes from the actual transportation of the wine itself. But it’s still significantly less costly to the environment and your. Scott Carney, concept manager at Eno Wine Rooms estimates that since they’ve switched to a wine on tap system they've "eliminated about 5 tons of glass and cardboard waste a year." A huge difference! However, wine kegs do have their limitations. Consumers can’t purchase a keg themselves, they can only buy a glass from one and it will take a while for a wide variety of high quality options to become available. Wine Kegs are also unable to produce aged wine due to the lack of oxygen entering the bottle and let’s be honest, vintage wine is delicious. We’re definitely not saying to get rid of bottled wine altogether; just allow wine kegs to join the party. Once you evaluate all of the pro and cons it’s safe to say we're really looking forward to the wine on tap movement and we’re definitely not the only ones.Everyone’s keeping an eye out for the first venues to start serving wine on tap and our bets are those first few will be jam packed with business. 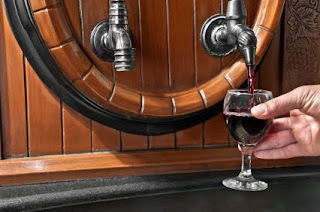 You can be sure this trend is about to take flight so if you own a restaurant, bar, winery or any other type of establishment that serves wine, we recommend you hop on the wine on tap movement as soon as possible. Cheers! © 2012 Divinity Beer Systems. Powered by Blogger.